Browse: Home / Lynis v-2.1.5 : is a system and security auditing tool for Unix/Linux. 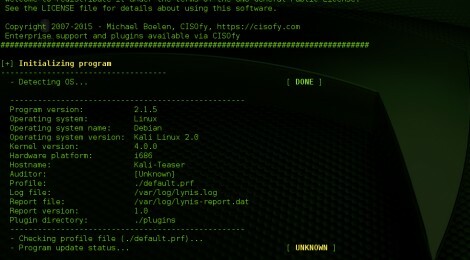 Lynis v-2.1.5 : is a system and security auditing tool for Unix/Linux. This is an major release, which includes both new features and enhancements to existing tests. CFEngine detection has been further extended. Additional logging and reporting of automation tools. Depending on the operating system, Lynis now tries to determine if failed logins are properly logged. This includes checking for /etc/login.defs [AUTH-9408]. Merged password check on Solaris into AUTH-9228. Added new compliance_standards option to default.prf, to define if compliance testing should be performed, and for which standards. IPFW firewall on FreeBSD test improved. ESET and LMD (Linux Malware Detect) is now recognized as a malware scanner. Discovered malware scanners are now also logged to the report. Improved support for Debian 8 systems. Boot loader exception is not longer displayed when only a subset of tests is performed. FreeBSD systems can now use service command to gather information about enabled services. Detection of virtual machines has been extended in several ways. Now VMware tools (vmtoolsd) are detected and machine state is improved with tools like Puppet Facter, dmidecode, and lscpu. Properly detect Docker on CoreOS systems, where it before gave error as it found directory /usr/libexec/docker. [AUTH-9328] Show correct message when no umask is found in /etc/profile. It also includes improved logging, and support for /etc/login.conf on systems like FreeBSD. ← Sawef – Send Attack Web Forms.